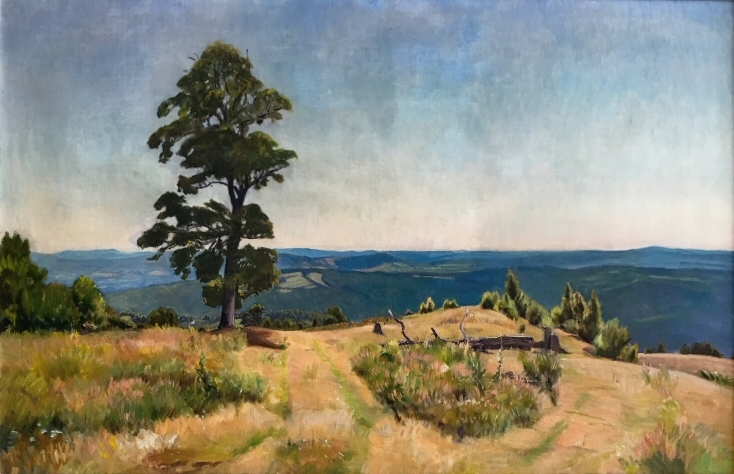 RSW- Artwork page, "Unnamed: High in Leyden"
This painting is unnamed, unsigned, and appears to be unfinished. TOP: a close up of Woodward painting from his Packard. 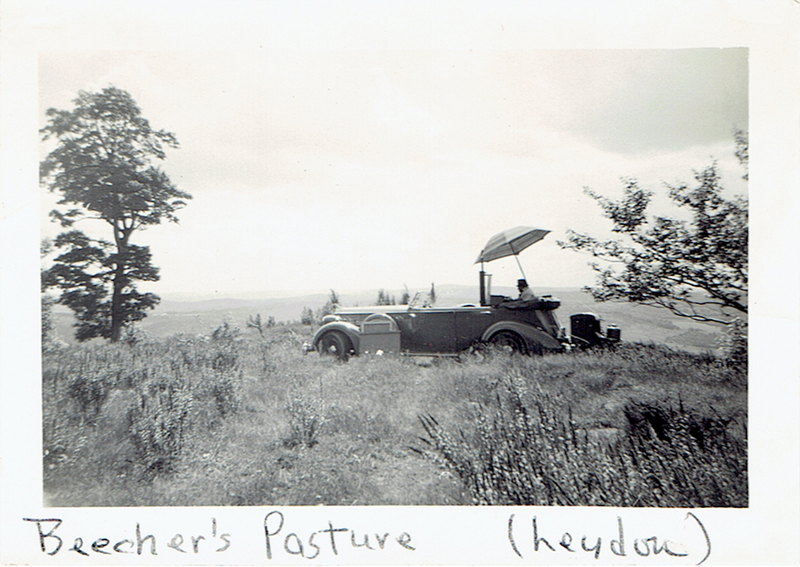 car, pasture and tree. Photographer unknown. Reminicent of RSW's Beech Tree, this piece has a tall elm standing alone overlooking a "sea" of hills. It is unnamed, unsigned and feels incomplete or unfinished but we are glad to add it to our catalogue. Even unfinished, it is wonderfully Woodward's distinct perspective. The reason we feel this may be unfinished is the lack of detail to the tree itself. Also, There seems to be some missing elements of "light" and color for which RSW was known. We wonder, is the sky finished? 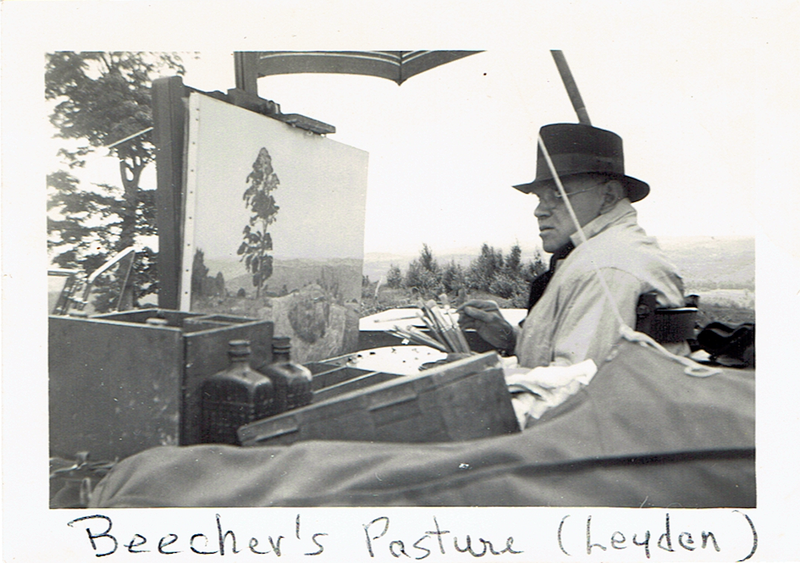 The pictures to the right are a couple of the best examples we have of Woodward painting en plain aire, a phrase used to describe artist painting in the field. They were found in an old scrapbook organized by Dr. Purinton. This painting is privately owned and was sent to us by it's current owner and we cannot express enough how grateful we are.